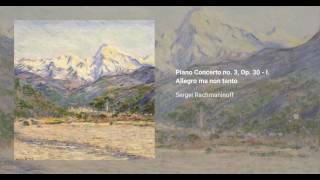 Sergei Rachmaninoff wrote his Piano Concerto no. 3 in D minor, Op. 30 in 1909. It is considered a very demanding piece, which inspires respect between piano virtuosos (the dedicatee, Josef Hofmann, never played it, and pianist Gary Graffman was quoted saying that he should have learned it while he was young and didn't know what fear was). 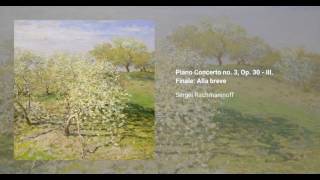 It was premiered in 1909 by Rachmaninoff himself as the soloist with the New York Symphony Society conducted by Walter Damrosch. It was later performed with Mahler as a conductor, a experience that apparently touched Rachmaninoff. The piece became widely popular in the 1930's thanks to Vladimir Horowitz. 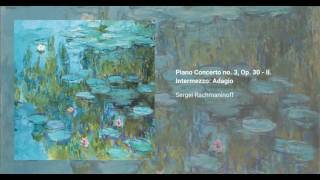 It is structured in three movements: even though Rachmaninoff authorized several cuts to be made at the performer discretion (in an attempt to make the work more appealing to audiences) nowadays it is usually performed in its original version, which lasts around 40 minutes.